Newest Overwatch hero Brigitte was officially announced late last week, but has already received a tuning pass on the PTR. Most notably, the cost of her Ultimate has been increased by 30%, meaning she’ll be casting it less often. However, her passive Inspire effect had its cooldown reduced from 2 seconds to 1.5 seconds — meaning as long as she’s in the fray swinging her weapon around, she’ll be applying her heal effect to her allies more often. The change to Brigitte’s Rocket Flail mirrors some of the early balance changes in Overwatch. When the game first released, you could skip the reload animation on weapons by using a melee attack. The melee attack was faster than the reload, allowing players to start shooting again faster than intended. This change seems to be in a similar vein; you can no longer use animation tricks to attack faster than intended — nor can you do it accidentally. 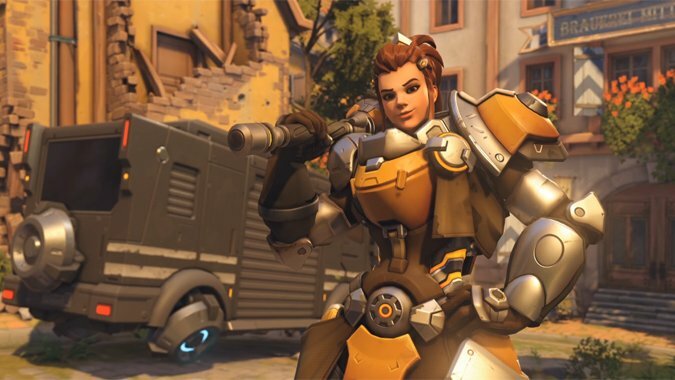 While Brigitte’s base skin shows off her current role as a Crusader and Reinhardt’s squire, her Engineer skin is a throwback to her engineering background — and pulls a lot of influence from her father, Torbjorn. The color scheme, the detailing, and the gear motif are all a great nod to her father. Both of Brigitte’s appearances are great so far; I’m excited to see what else they come up with down the road.